Puerto Vallarta, A Sweet Escape Just a Flight Away! Surrounded by mountains, rivers, and beaches the city of Puerto Vallarta is a great tourist attraction due to its friendly environment, a diverse weather year through, magical sunsets and picturesque locations. Puerto Vallarta takes its name to honor Ignacio L. Vallarta, legendary attorney at law, jurist and former governor for the State of Jalisco. With a surface extension that takes over 1,300 square kilometers, including four important sections within the port: Marina Vallarta, the Hotel Zone, Downtown and South Zone. Enjoy lively traditions, local handicrafts, rural streets, open-air activities, and nightlife all in one place. The sparkling South Zone includes the Romantic Zone or Pink Zone, the place for sun lovers and the golden sand of Playa Los Muertos. Icon to Puerto Vallarta’s Downtown is the Lady of Guadalupe Church, its bell tower underneath a crown sparkled with angels, summons you to come and stroll along the remodeled Malecon. To the north, the Hotel Zone displays the greatest variety of hotels and business, malls and several kilometers long of beautiful beaches. As any good port, there’s the fully refurbished Marina offering top of the line infrastructure to dock three cruisers, in addition to housing luxury yachts and boats from all over the world. 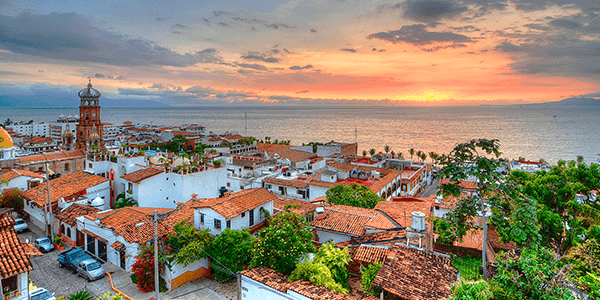 Puerto Vallarta is a picturesque place full of history, but also modern, vibrant and exotic. Festivals year-through brings in a diversity of tourists, from cuisine lovers to extreme mountain sports. Its gastronomy brings together the best of the best, finding classical Mexican snack-foods that take over the most demanding palates, to the most spectacular and ostentatious dishes by highly regarded Chefs. Home to the famous Gourmet Festival created by Thierry Blouet and Heinz Reize over 20 years ago; this is a festival to enhance the region’s gastronomical knowledge. Puerto Vallarta is filled with culture, traditions, stories of ships, pirates, and treasures on its beaches; legends about the native people and all the magic of past brought forth into the present. Its cultural essence can still be relived strolling down its cobbled streets, observing its typical rooftops and feeling the warmth of its people. Basilio Badillo #365, Puerto Vallarta, Jal. Av. Francisco Villa #1749, Puerto Vallarta, Jal. Av. Las Américas #565, Puerto Vallarta, Jal. Revolución #350, Las Juntas, Puerto Vallarta, Jal.